Be the first to share your favorite memory, photo or story of Bonnie . This memorial page is dedicated for family, friends and future generations to celebrate the life of their loved one. Bonnie Morris, age 64, of Holbrook, PA, passed away Tuesday, October 23, 2018, in her home with her family by her side after a brave battle with cancer. 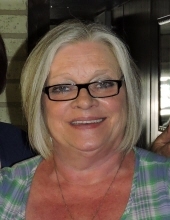 Born July 6, 1954, in Waynesburg, PA, she is the daughter of the late Charles Floyd and Mary Jane (Tedrow) Martin, Sr.
Bonnie was a resident of the Holbrook area since 1976. She graduated from West Greene High School in 1974. Bonnie was a member of the Maranatha Baptist Church. She married Ronald E. Morris on May 22, 1976. She was a former employee at Greenway Manufacturing. Bonnie was a member of the New Freeport Volunteer Fire Dept. Ladies’s Auxiliary. She enjoyed shopping and gardening but most of all, her family and fur baby Gidget. She is survived by her husband of 42 years, Ronald E. Morris, of Holbrook, PA; a daughter, Michelle Morris, of Richmond, VA; a brother, Charles “Bub” Martin, Jr., of Aleppo, PA; three nieces and one nephew. At Bonnie's request, all services are private and have been entrusted to Kesterson-Rush Funeral Home, LLC. 3275 W. Roy Furman Hwy. Rogersville, PA 15359. Telephone: 724-499-5181. Memorial Contributions may be made in Bonnie’s memory to the American Cancer Society, www.cancer.org. To send flowers or a remembrance gift to the family of Bonnie Morris, please visit our Tribute Store. "Email Address" would like to share the life celebration of Bonnie Morris. Click on the "link" to go to share a favorite memory or leave a condolence message for the family.